Sarah is getting better at fractions. 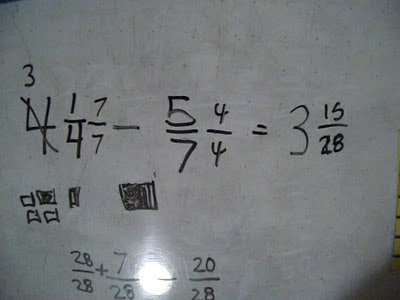 Her mom wants the focus on algebra because the test coming up will have a lot of algebra on it, but I see students all the time that have trouble with algebra because they don't understand fraction concepts. Rules and process are quickly forgotten. Concepts aren't. So far we have covered addition and a little subtraction of fractions and she understands that "the name of the game is to make them same." Then we can add, subtract or divide...with multiplication we just multiply and I'm going to try and get her to discover WHY we can just multiply without making them same and why we invert and multiply when we divide. Hint for you it's a short cut to making them same. For now we spent a little over an hour doing this and by the end of the hour she was getting pretty good. Here is 15 minutes of that hour. Note there are fewer pictures and symbols here but we started with the blocks and drew pictures and then I remembered to turn the camera on for a bit. You always start in the concrete then draw THEN go to symbols only, and here at the end I went back to tie it together. You can gauge your students understanding by their facial expressions. Here I could see she was "getting it" but more reinforcement is needed not just because she is autistic but because repetition is the mother of skill for ALL children. If you have young students, you can do these lessons and then months or years later do them again...after many impressions the knowledge is ready for instant recall. Homeschoolers have the opportunity to cover the same ground like it's new if you start them very young. The idea that they cover it once in 5th or 6th grade and then they'll have it forever is ludicrous to my mind. The idea that autistic kids can't do this is being disproved right before your very eyes. Due to the brain damage caused more than likely by mercury injections, she will need EXTRA repetitions but that's all. Once she understands it the nuero-pathways can be built and reinforced. You can now get fractions materials at the house of math. That page has lots more info than just how to by a kit plus some free PDF's and a caution on using fraction worksheets too early in the game. Fractions FUN begins with manipulatives not worksheets. Also Sarah's page is expanding. More vids are there, some of which you won't find here or anywhere else...but you need a password. Find me on FACEBOOK or Twitter. Crewton Ramone, there is only one.